Section A: different types of business information, their purposes and sources. 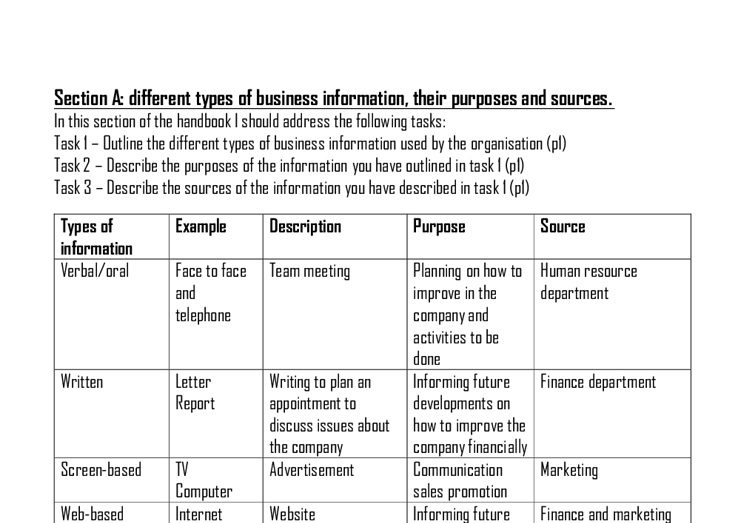 In this section of the handbook I should address the following tasks: Task 1 - Outline the different types of business information used by the organisation (p1) Task 2 - Describe the purposes of the information you have outlined in task 1 (p1) Task 3 - Describe the sources of the information you have described in task 1 (p1) Types of information Example Description Purpose Source Verbal/oral Face to face and telephone Team meeting Planning on how to improve in the company and activities to be done Human resource department Written Letter Report Writing to plan an appointment to discuss issues about the company Informing future developments on how to improve the company financially Finance department Screen-based TV Computer Advertisement Communication sales promotion Marketing Web-based Internet Website Informing future development and communication sales promotion Finance and marketing department. Multimedia Web pages Magazine Bill boards Fliers Posters Financial accounts, Monthly magazines Inviting support for activities. Updating information Strategic development Finance department Government Electronic methods of communicating business information In this section of the handbook I should describe the electronic methods of communication which is used by the organisation to communicate business information clients/customers. 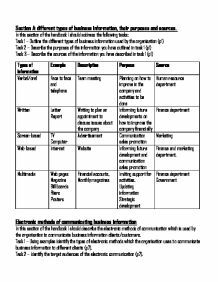 Task 1 - Using examples identify the types of electronic methods which the organisation uses to communicate business information to different clients (p7). Task 2 - Identify the target audiences of the electronic communication (p7). Task 3 - Describe the reason why the organisation has used the types of communication (p7). Email - emails provide new product information, a target audience could be customers, staff, suppliers, shareholders and even the general population. E-mail has become the primary means for delivering short text messages within organisations that are networked. As e-mail between organisations becomes more common, the medium will increasingly take the place of fax, particularly as whole documents can be sent as e-mail attachments. ...read more. Domino's pizza targets at every age group, starting from a young age. The best way to advertise their product was to make it worldwide and providing it in different areas where millions of people will be likely to see it and feel interested. They used television, online websites and other social networks (facebook, twitter). The advert draws people closer to them and helps viewers realise who they were, the mistakes they've made in the past and ways they have chosen to better themselves and improve the company The advert is quite memorable as it's quite entertaining as they are not just talking but show pictures of how they make the pizza as well as ways they've made it in the past which is an improvement, help their customers gain more interest in their products. http://www.youtube.com/watch?v=AH5R56jILag Section G Part 1 I will be writing a report in which explains the steps the organisation has taken to comply with the above law and regulation. Data Protection Act Give brief description of what it says How Tesco complies with Data protection Act Tesco follows the steps of the data protection act by keeping any personally identifiable private data, without the explicit informed consent of the individual consumers, and then they should not be so fearful about responding to the guardian journalists legitimate subject data access requests. Tesco, and their rivals, data gathering retention and profiling policies must be made transparent to the public. So Tesco makes sure that all information is kept confidential. Customers' information may be passed to and used by all Tesco companies. We will never pass your personal information to anyone else, except where we are required or permitted to do so by law, for any successors in title to our business and suppliers that process information on our behalf both in the UK and abroad. We may also use and disclose information in aggregate (so that no individual customers are identified) ...read more. This method is used as it is fast because the customers can call in at any time and can call from anywhere, it would be a private conversation as the customers information will be kept confidential unless needed for a valuable reason. M2 In this section I will be analysing the legal, ethnical and operational issues in relation to the use of the business information. Legal Issues There are many parts in the legal issues which are: * The issues of privacy * Consideration/feelings * Misleading * Falsehood * The right of the public to know. The issues of privacy are the ability of an individual or group to seclude themselves or information about themselves and thereby reveal them selectively. The reason why this is a legal issue is because people should be able to be confident when there confidential things are being put out to the public. Privacy gives them an opportunity to prevent people from seeing certain things if the person doesn't wish to show it to people but to keep to themselves. The area that Health & Safety covers is extremely extensive when you take into account the diversity of the industries where each one has specific Health & Safety issues. Businesses are usually considered to have low risk when it concerns electrical hazards but it still is one of the main causes of personal injury and fire. With the more machinery and equipment that the business have in the premises, the risk increases but for now, Businesses will just consider the office with the common electrical equipment of, say, computers, fax machines, fans, etc. There is no way of eliminating such dangers as it is entirely down to how the user operates the equipment with respect to the potential dangers that can occur from miss-use. It is therefore your responsibility to make sure that all electrical equipment (including power points) is maintained so that the risk of injury is low. ...read more. Much of this ignores the specification as the information is too general and not related to a particular business. At other times the writer is really not thinking through what they are writing and has not done sufficient research. first phase is better to start an advertising campaign which must be well prepared in order to touch the Asian customers because this kind of advertising implies huge costs but in the case of a success the reward will compensate the efforts. Stakeholders in Tescos and Cancer Research. How much will donors care if charities get more clear, especially about what's important/what they achieve? Some may not care too much, as long as a rumour doesn't come out that will destroy their trust. But some will, especially the High Impact part of donors. Tesco use online surveys on a regular basis through their website and through email. Whilst browsing the Tesco website you may be asked to kindly take part in a survey or you may receive an email asking you to take part. their web based information give a more understanding about their organisation by creating clear indication what their website is. It?s big so people look at it while they are walking pass it. Anyone who steps in to the place the first they do is they look at it. It?s eye catchy. It is short and easy for people to read. An advantage of using notes it that it can help save time as well as reminding member of staffs efficiently and tell their employees/staff on upcoming events/activities The disadvantage of notices is that it can create a waste of paper and a mess when they are too many notes accumulating in one place all at once. Farmers markets have also been impacted by changing Social and working patterns, this is because some people like freshly grown produce and therefore go to the farmers markets. This means farmers ensure that the produce is fresh from the day before for the customers to purchase.